ROME (CNS) — In the heart of Rome, near streets of fancy shops already blinged out for Christmas shopping, Pope Francis prayed for Romans struggling to survive and for families in the city and around the world who face the same lack of welcome that Mary and Joseph experienced. 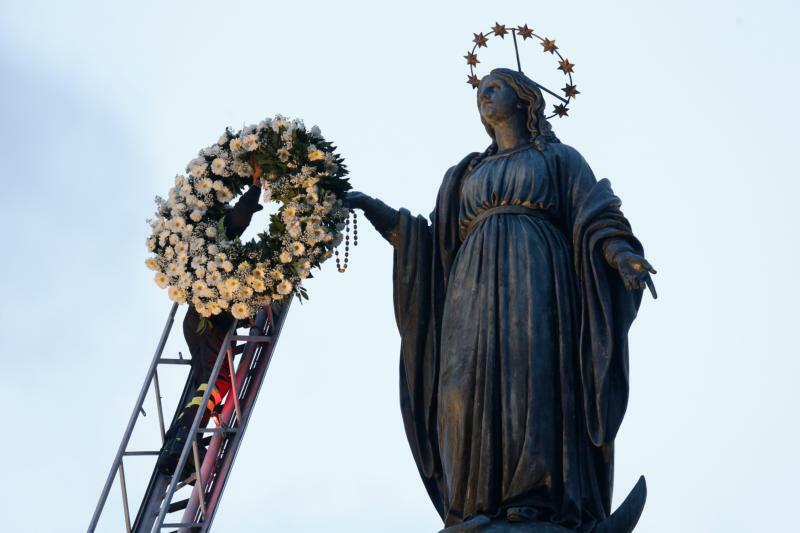 The pope concluded his public celebration of the feast of the Immaculate Conception, Dec. 8, by making the traditional papal visit to a statue of Mary erected in Rome’s historic center to honor Catholic teaching that Mary was conceived without sin. The statue is located near the Spanish Steps and Rome’s most expensive clothing and jewelry stores; it is also next to the building housing the Vatican Congregation for the Evangelization of Peoples. Instead of making a speech near the statue, the pope composes and reads a prayer, and he leaves a basket of roses at the statue’s base. In the prayer addressed to Mary, he said, “In this Advent time, thinking of the days when you and Joseph were anxious for the imminent birth of your baby, worried because there was a census and you had to leave your village, Nazareth, and go to Bethlehem — you know what it means to carry life in your womb and sense around you indifference, rejection and sometimes contempt. “So, I ask you to be close to the families who today in Rome, in Italy and throughout the world are living in similar situations,” the pope continued. He asked Mary to intervene “so that they would not be abandoned, but safeguarded with their rights, human rights that come before every other, even legitimate, demand,” an apparent reference to rights of migrants and refugees and the right of nations to control their borders. Earlier, under brilliantly sunny skies, some 30,000 people gathered in St. Peter’s Square to recite the midday Angelus prayer with Pope Francis. Before leading the prayer, he offered a meditation on the Bible readings for the day’s feast, highlighting the difference between Adam, who sinned and then hid from God, and Mary, who was conceived without sin and offered her life totally to doing God’s will. “The ‘Here I am’ opens one to God, while sin closes, isolates, keeps one alone with oneself,” the pope said. “Why don’t we begin each day with a ‘Here I am, Lord’? It would be beautiful to say each morning, ‘Here I am, Lord, may your will be done in me today,'” he said. Turning one’s life over to God and to doing his will does not mean life will be free of troubles and problems, he said. Mary’s wasn’t. “Being with God does not magically resolve problems,” he said. The “wise attitude” of Mary, which all Christians should try to imitate, is not to concentrate on the succession of life’s problems — “one ends and another presents itself” — but to trust in God and entrust oneself to him each day, Pope Francis said.